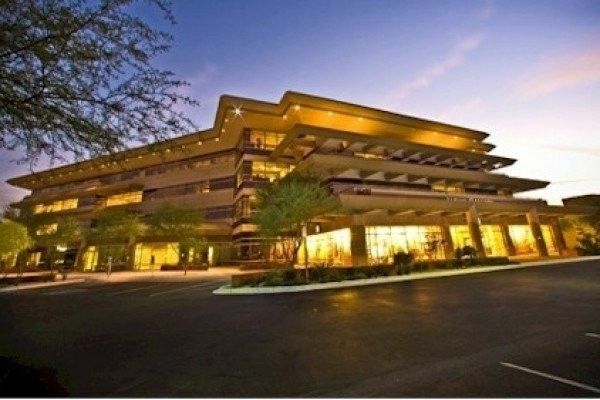 Serviced offices in Scottsdale surrounded by a myriad of upscale restaurants, shops and hotels, this office space boasts one of the Valley`s foremost locations at the corner of Scottsdale Road and Frank Lloyd Wright. This prime fourth floor location offers spectacular vistas of the McDowell Mountains and North Scottsdale valley. Courtyards, walkways and a high-profile sculpture spire in a Frank Lloyd Wright design offset the property`s lush, mature landscaping. The business center is in a prime corner location adjacent to the Promenade Retail Center and Scottsdale Airport, one of the top five executive airports in the country. And, it is located within 1/4-mile of the upscale Kierland Commons Shopping Center and Scottsdale Quarter Shopping Center. This prominent location is easy to reach and within 1.5 miles from two exits off the Loop 101 freeway or by commuter bus.